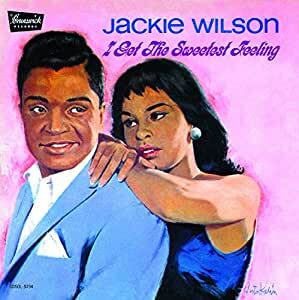 The Brits got it right by making Jackie Wilson's "I Get the Sweetest Feeling" a three-time chart hit that reached the Top Ten twice, once in 1972 [#9] and again in 1987 [#3]. It represents the perfect fusion of Chicago soul and Motown influence, as sincerely joyful and effervescent as can be. And it doesn't hurt that no one in the pop-soul field possessed pipes like his that could bring such gospel power and enthusiasm to happy and romantic songs. But "Sweetest Feeling" [#12 soul / #34 U.S. pop in 1968] is not alone here. "Since You Showed Me How to Be Happy" (the semi-clone direct follow-up to "[Your Love Keeps Lifting Me] Higher and Higher") is a delight in its own right [#22 soul / #32 U.S. pop]), and "You Brought About a Change in Me" [a B-side that got to #65 in Record World but nowhere else] is right up there, too, with its boundless optimism and buoyancy. Bonus track B-side "The Who Who Song (Nobody But My Sweet Baby)" is insanely propulsive, catchy and hook-laden and has an exuberant Jackie wailing out of soulful joy. The female chorus's "who-who-who-who-who-who" and "my sweet baby" refrains are worth the price of admission. As if this LP's Motown vibe isn't explicit enough, try Jackie's commanding leadoff-track take on the Supremes' "You Keep Me Hangin' On." For sheer Chicago soul-blues excellence, the song "A Woman Needs to Be Loved" is a masterpiece, whether it be in this fantastic version (with strings and stinging blues guitar) or on Tyrone Davis's "Can I Change My Mind" B-side. In the wake of the huge crossover success of "Higher and Higher," this follow-up Carl Davis-produced LP got wrongly overlooked and fell short of charting nationally at all. This is a shame because it is a phenomenal showcase for Jackie Wilson (a.k.a. "Mr. Excitement") at his late-1960s peak. A huge plus here is that this late-2014, limited-edition Japanese-import CD sounds out of this world with its Ultra-Range hybrid stereo/mono sound processing.